From his website, it appears that creative-genius animator Bruce Bickford (featured in the previously mentioned documentary Monster Road, which I watched for the second time this weekend & enjoyed it as much as the first time) is working on a homage to David Lynch’s Twin Peaks, one of my favorite TV shows of all time. Check out the gallery by clicking the picture below. 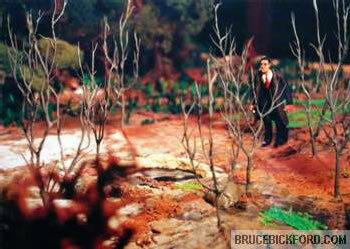 Above: Agent Cooper enters the Glastonbury Grove. I recently had the good fortune of seeing the movie Monster Road, and I’m looking forward to seeing it again. It’s a documentary about genius stop-motion animator Bruce Bickford (who is best known for animating some Frank Zappa videos) and his aging father. Bickford is an amazing, prolific and obscure artist, and the extensive excerpts from his work in the movie are mind-blowing. Besides all that, this is among the best crafted documentaries I’ve seen in my life (and I’ve watched a lot of documentaries)… it is profound, moving and inspiring. I hope it gets all the attention it deserves. The DVD is available for purchase on the Monster Road website, and is well worth the money. Here’s the trailer.